RE/MAX Hokkaido has announced the opening of office in Hokkaido Metropolitan : RE / MAX YOUTOPIA URBAN (address: Chuo-ku, Sapporo City, CEO: Junichi Kawamura ) on November 1, 2018. RE/MAX Hokkaido has announced the opening of office in Hokkaido Metropolitan : RE / MAX KYOUEI (address: Higashi-ku, Sapporo City, CEO:Ayahiko Nakamura ) on November 1, 2018. RE/MAX Osaka has announced the opening of office in Osaka Metropolitan : RE / MAX ROYAL (address: Nishi-ku, Osaka City, CEO: Risa Morinaga ) on November 1, 2018. 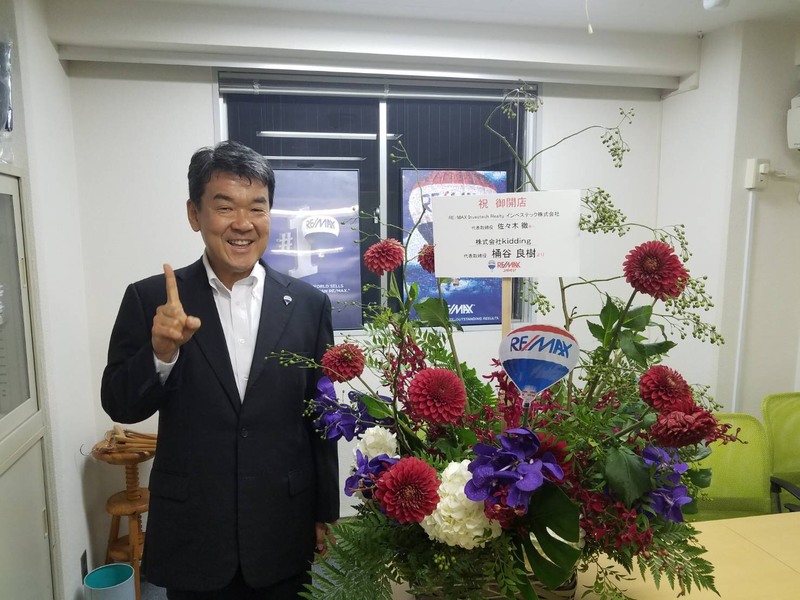 RE/MAX Osaka has announced the opening of office in Osaka Metropolitan : RE / MAX PRIME (address: Joto-ku, Osaka City, CEO: Takahiro Suruwatari ) on November 1, 2018. RE/MAX Kansai has announced the opening of office in Hyogo Metropolitan : RE / MAX Live (address: Kitaguchi-cho, Nishinomiya City, CEO: Makoto Takahashi ) on October 11, 2018. RE/MAX Osaka has announced the opening of office in Osaka Metropolitan : RE/MAX APEX (address: Kita-ku, Osaka city, CEO: Mitsugu Aramata) on October 01, 2018. RE/MAX Osaka has announced the opening of office in Osaka Metropolitan :RE/MAX L-Style (address: Sumiyoshi-ku, Osaka City, CEO : Masaaki Ohnishi) on September 10, 2018. RE/MAX KANSAI has announced the opening of office in Kyoto : RE/MAX COMMUNITY LAB (address: Shimogyo-ku, Kyoto city, CEO : Kazuhiko Tanaka) on September 01, 2018. RE/MAX TOKYO has announced the opening of office in TOKYO Metropolitan : RE/MAX TRIVET (address: Samoncho, Shinjuku-ku, Tokyo, CEO: Yoshinobu Saito) on September 08, 2018. RE/MAX OSAKA has announced the opening of office in Osaka Metropolitan : RE/MAX WINNERS (address: Nishinakajima, Yodogawa-ku, Osaka City, CEO: Holly Yu) on September 1, 2018. RE/MAX OSAKA has announced the opening of office in Osaka Metropolitan : RE/MAX ONE CREATE (address：Hannan-cho, Abeno-ku, Osaka, CEO : Yoshiyuki Hayashi ) on August 03, 2018. RE/MAX JAPAN has announced the opening of office in Tokyo Metropolitan : RE / MAX STARSEA (address: Shinjuku-ku, Tokyo Metropolitan, CEO: Ben Xu) on June 21, 2018. RE/MAX OSAKA has announced the opening of new office in Osaka: RE/MAX HILLS (Address: Motomachi, Naniwa-ku, Osaka City, CEO: Masayuki Oka) on June 01, 2018. RE/MAX JAPAN has announced the opening of office in Tokyo Metropolitan : RE / MAX Amistad(address: Shibuya-ku, Tokyo Metropolitan, CEO: Tsuyoshi Hikichi) on January 22, 2018. RE/MAX JAPAN have announced the opening of office in Tokyo Metropolitan : RE / MAX TAIKOU (address: Chiyoda-ku, Tokyo Metropolitan, CEO: Yoshikazu Kinoshita) on October 2nd, 2017.
kidding Inc. (HQ: Tokyo, CEO: Yoshiki Oketani), the operators of the RE/MAX JAPAN real estate franchise, have announced the opening of office in Tokyo Metropolitan : RE / MAX Investech Realty (address: Chuo-ku, Tokyo Metropolitan, CEO: Toru Sasaki) on August 3, 2017.